And I have a nail in my pocket: A zero Ligament or an Ellipsis of the Predicate? The author explores the above mentioned syntactic pattern against the background of existential and locative utterances. It is proved that the model in question is a subject-predicate, not a nominative one, and the lacking verb is not a copula, but a meaningful predicate. It is asserted that this model must be regarded as a result of a competing interaction between the two semantic categories, possessivity and locativity, which leads to the contamination of two basic syntactic models in one utterance: the possessive (U menya est’ velosiped = ‘I’ve got a bicycle’) and the locative model (V saraje lodka i velosiped = ‘There are a boat and a bicycle in the shed’). The consequence of this contamination is the following change in the correlation of the verb-lacking and the verb-present types of the model realization: when the local determinant is absent, this correlation is close to 1 : 1; when the local determinant is present, this correlation is close to 3 : 1, that is, the amount of the verb-lacking realizations is three times bigger than with the verb present. It is concluded that the speech syntactic patterns are worth studying, since they show features not predicted by any of the existing syntactic theories. Keywords: speech syntactic model; copula; predicate ellipsis; semantic category; possessivity; locativity. The article is focused on counter-optative infinitive utterances based on verbs of perception (Ne vidat’ by yego bol’še nikogda), and specifies the subset of verbs of perception functioning in counter-optative infinitive utterances. The author analyzes the reasons for the selectivity of the use of these verbs in counter-optative infinitive utterances (only 23 out of 95 verbs are presented in the subcorpus created with help of the Russian National Corpus and Google). The data is studied from the point of view of a number of parameters: the verb aspect, the temporal vector, and the personal reference of the infinitive utterances. It was found out that counter-optative infinitive utterances 1) prefer imperfective verbs of perception, which 2) denote uncontrollable actions. A verb of perception is more likely to be chosen 3) in counter-optative infinitive utterances with a futural temporal perspective. An important factor is also 4) the presence of a negative seme in the verb semantic structure. Keywords: Russian language; syntax; counter-optative infinitive utterance; verbs of perception; lexical-semantic group. The article discusses the types and functions of temporal deixis in the speech of participants of a radio interview, in particular, their potential to form both the image of the speaker and the image of time, epoch; it presents a comparative analysis of the contextual meanings of such elements as now / today and their lexical meanings, and shows the interdependence of deixis and changes in human consciousness in course of time. Keywords: temporal deixis; speech of a radio host; speech of a respondent; today; now. The article is devoted to the matter of marking and describing text categories in manuals. The text is represented as a result of discourse, linked to peculiarities of speech situation. The author has made the algorithm of the discursive process to determine some structure elements. These elements are performed as projections of text-connecting categories. Keywords: manual; text; discourse; algorithm; text-connecting categories. The article traces the process of developing borrowings with two consonant doublings in the etymon from the 17th century up to the middle of the 20th century. Usually such words retain the second pair of consonants (komissiya). When doubling is motivated by the composition of a word, the second pair can be lost (abbatisa), or both pairs of consonants in originally complex words can survive (belladonna, parallelogramm). Keywords: history of spelling; development of borrowings; double consonant doubling. The author argues that slogan has always been considered as the key genre of political communication. However, this genre has been influenced by a number of changes caused both by linguistic and extralinguistic factors. The influence of strategies of the election campaigns of 1996, 2006, 2018 on the stylistics and pragmatics of slogans is demonstrated in the article. Keywords: slogan; political communication; strategies of communication. The article studies phraseological euphemisms representing the topic of the bribe from the cultural-linguistic point of view, and describes the cultural and language components of their meaning. Russian and Arabic newspapers and literary texts were chosen as a material for this study. Keywords: phraseology; euphemism; cultural stereotypes; Russian language; Arabic language. 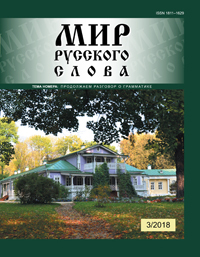 The authors explore the specificity of linearization (making linear sequences) and the syntactic techniques in modern poetry, and highlight the interaction between the general factors determining the grammatical features of any national poetry as a collection of texts of verbal art, the significant semantic and formal characteristics, which are giving its unique coloring to modern Russian poetry. The illustrations are borrowed from the poetry of N. Azarova, D. Vedenyapin, Ju. 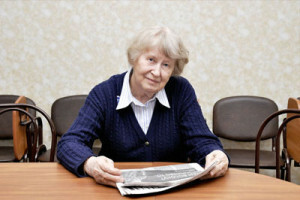 Skorodumova, A. Ulanov, and other present day authors. Lyrical poetry is viewed from the viewpoint of N. D. Arutyunova’s theory (further developed in the article), concerning the paradigmatic and the syntagmatic syntax in texts of verbal art. Keywords: grammar; modern poetry; Russian poetry; linearization; paradigmatic syntax; syntagmatic syntax. The article focuses on the specificity of laugh in Sergey Dovlatov’s story “The Suitcase”. The author offers to classify laugh into seven types, as the components of the literary emotional space, which carry out various functions in representing the images of the characters of Dovlatov’s short stories, and their relationships. Keywords: emotion; laugh; expression of emotion; literary space; Dovlatov. The article considers the short prose by N. S. Leskov (“Concerning ‘The Kreutzer Sonata’”) in light of the theory of the literary field, developed by Pierre Bourdieu, and proves that Leskov’s strategy towards the prophetic status of the writer in Russian literary field of the late 19th century tends to be subversive. Keywords: history of Russian literature; sociology of literature; Nikolai Leskov. The author analyses the peculiarities of the functioning of exotisms in the Caucasian poems by M. Yu. Lermontov: “The Circassians”, “Caucasian Prisoner”, “Kally”, “Ismail-Bei”, “Aul Bastundji”, “Khadji-Abrek”, “The Fugitive”, “Demon”, “The Novice”. The orientalisms name the realia of the Caucasus, reproduce the national color, play the role of the means of artistic expressiveness. Keywords: M. Yu. Lermontov; the Caucasus; poems; exotisms; orientalisms. The article analyses the contribution of F. I. Buslaev to the development of listening teaching methods in Russian (native) language. The author reveals the results of students’ listening, which are mentioned in Buslaev’s first methodological and linguistic work, and the conditions of their achievements, substantiated by this scholar and methodologist; enumerates the principles of native language teaching, which were mentioned by Buslaev and can be applied to the learning process of listening. Keywords: F. I. Buslaev; kinds of speech activity; listening; understanding; listening results. The author argues that traditionally a phraseology reflecting the spirit of the people can be treated as a ‘value’ that is important in the intercultural, including oral, communication. The analyses of the speech material reveals many phenomena of this type that can complicate the understanding of Russian speech. This is a plentiful idiomatic of varying degrees of assimilation by the Russian language itself: classical/typical phraseological units, proverbs and sayings, modified or occasional idioms, precedent texts. Without taking into account these data, which are in many respects ‘negative’, it is impossible for the foreigners to learn successfully Russian in all its functional and semantic diversity. Keywords: everyday speech; oral communication; communicative hindrance; pragmatic item; idiom; precedent text; sound corpus. The article concerns the creation of General Modal-Aspectual Classification of Subjective-Modal meanings in Russian Wish/Intention semantic field, as well as its presentation via non-traditional complex modal and aspectual sense generating branch method. There are 18 subjective-modal meanings and 74 language means of their expression presented in the work, and two methods (Matrix and Generative Branch) are being discussed in terms of their advantages and disadvantages referring to RFL teaching sphere. Keywords: subjective-modal meanings; wish/intention semantic field; general modal-aspectual classification; matrix; generating branch; method of presenting the educational RFL material. The author argues that an important aspect of intercultural communication is the communicative behavior of representatives of different linguistic cultures. Knowledge of the features of communicative behavior allows developing effective methods of foreign language teaching. The article examines the specifics of the national communicative behavior of the Greeks, studying the Russian language, on the example of a survey of the future guides-translators, and reveals the following features of the communicative tactics of the Greeks: minimizing the risk of conflict; willingness to compromise; tact; attentiveness to the interlocutor. It was found that the Greeks tend to avoid any conflicts, appeal to humor as a tactic used to get out of difficult situations. The author concludes that in case of professional orientation of teaching Russian as a foreign language it is necessary to model training and professional situations in order to prepare students to communicate with representatives of another culture. Keywords: cross-cultural communication; communicative behavior; Greek students; guides-translators; Russian as a second language; questionnaire.